Yip Man // Braw Power and Beyond! It's been a mega braw year for Yip Man and the debut album, Braw Power, our one and only release on Armellodie this year. This post is a sorta one-stop-shop incase-you-missed-it affair! 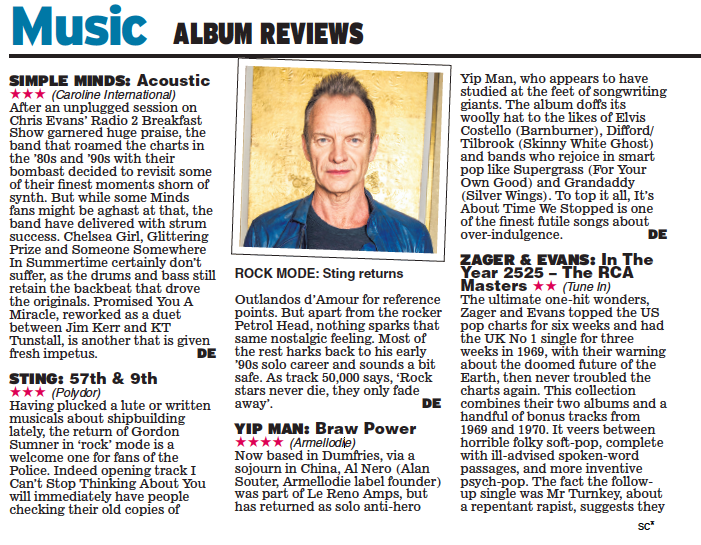 The album has picked up a host of plaudits from the likes of The List, God is in the TV and Is This Music as well as The Scotsman and Scottish Daily Express (see below). The album was also a big hit with BBC 6 Music with spins by Lauren Laverne, Gideon Coe, Radcliffe and Maconie, Tom Robinson and Steve Lamacq. Radio Scotland weren't sloppy on getting onboard either with Billy Sloan getting stuck in and dude-of-dudes, Vic Galloway including the record in his favourites of the year. There's also a super acoustic session which you can hear again courtesy of Is This Music on Regal Radio. The album was not only stuffed full of winners but some seriously cool videos to boot. Massive thanks to Jason and Lynsey at Poppycock Films (dir: Barnburner, For Your Own Good) and Ian Tilling (dir: Not That Easy) for all the stellar efforts. There's a handy playlist here if you want to check them all out. You can also see how the album was made in this sweet little 'Making Of' video below. So what's next for our caped crusader? Well first off you can all set your wirelesses to the Vic Galloway Show on BBC Radio Scotland on Monday 9th January where you'll find Yip Man and his band of merry Yip Men in session. Following that there's a show at Celtic Connections taking place at the Hug and Pint, Glasgow (Get your tickets here) on Saturday 4th February 2017. Also on that bill are the mysterious Bloke Music, Armellodie's latest addition to the roster, who are readying their debut EP for next year. So there you have it. Join the Yip campaign if you haven't already and get the album! There's only one thing left to say... over to you Wagner!